We departed from Naval Station Newport (NAVSTA) shortly after 2:00 pm on June 18th. During our first three full days at sea, we have been intermittently retrieving marine acoustic recording units (MARUs–more on this later) and recording whale sightings on Georges Bank. Georges Bank is an elevated area of sea floor extending from Cape Cod, Massachusetts to Cape Sable Island in Nova Scotia. This special place is a feeding ground for cetaceans because the topography and position of the bank result in an upwelling of nutrient-rich water which supports a high level of productivity. Our day begins at 7:30 am when we begin watch sessions. Every hour and a half, we rotate through three stations. Scientists at two stations use high-power binoculars, dubbed “big eyes,” while a scientist at another station records sightings. 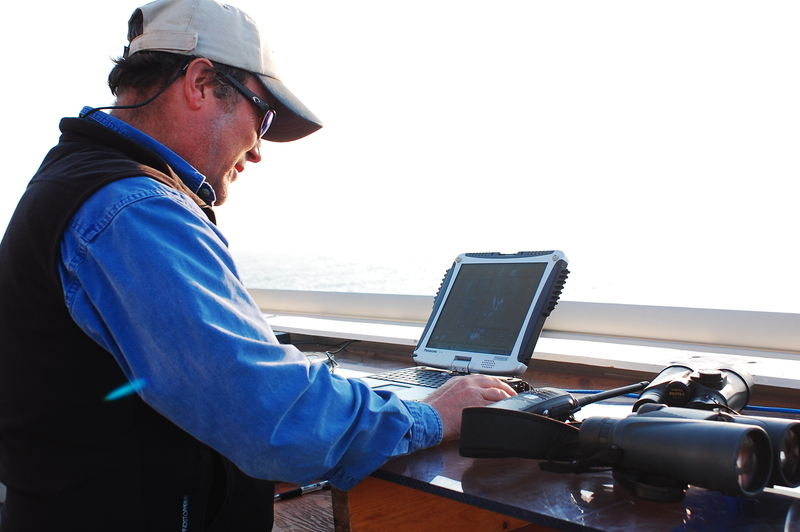 Peter Duley enters data from a sighting on the fly bridge. Me on the “big eyes” scanning for whales. Environmental conditions and ship position data are recorded concurrently. All of this data can then be used together to monitor certain species and to create statistical models of whale populations. Spout: The spout is a column of moist air emitted from the whale’s nostril (blowhole) on its back as it exhales. Right whales and humpbacks have short, bushy spouts, while fin and sei whales have tall, columnar spouts. If the wind is strong, it can be hard to distinguish them. 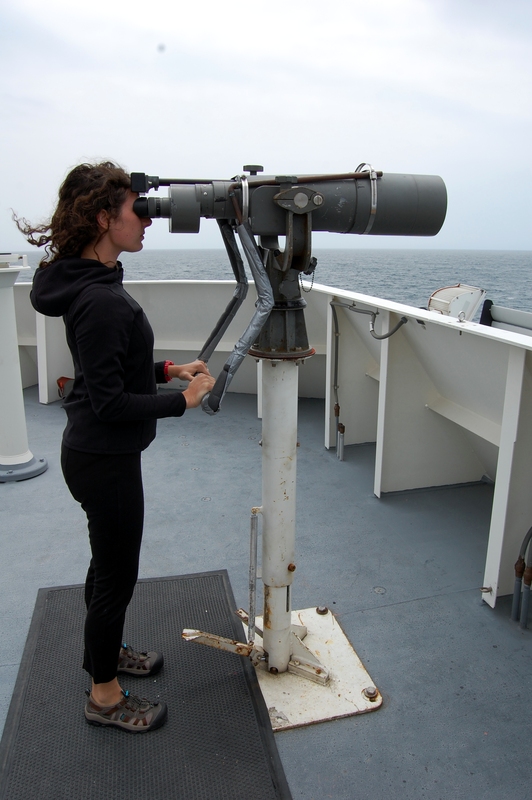 Luckily, there are a couple of other ways to identify whales from a distance. Dorsal fin: This is the fin on the whale’s back behind the blowhole. Right whales do not have dorsal fins, and humpback whales have a bit of an extra “hump” on their dorsal fin. Fin and sei whales are slightly more tricky to distinguish. The best way to distinguish them is to recognize that the dorsal fin on a sei whale is taller than on a fin whale. There is also a white coloration pattern forward of the dorsal fin on a fin whale called a chevron. Sei whales do not have these. Fin whales also have white markings on their lower jaws, which sei whales do not have. Fluke: The fluke is the whale’s “tail.” Humpbacks and right whales show their flukes more often than the others when they dive. Right whales have a very smooth black fluke, while humpback whales have more deeply notched flukes that can range in color from all white to all black. So far on this cruise we have seen: humpback whales, pilot whales, fin whales, sei whales, minke whales, sperm whales, common dolphins, white-sided dolphins, Risso’s dolphins, striped dolphins, bottle-nose dolphins, mola-mola, and a Portuguese man o’ war. No right whales yet, though tomorrow we plan to cross the Great South Channel in order to retrieve more MARUs, with a possibility of a sighting there. There was also an aerial survey over Georges Basin– the extreme northern edge of George’s Bank– today that reported 12 right whales. We hope to see plenty before the cruise is over, as right whales are the species targeted for biopsy and photo-identification on this mission. 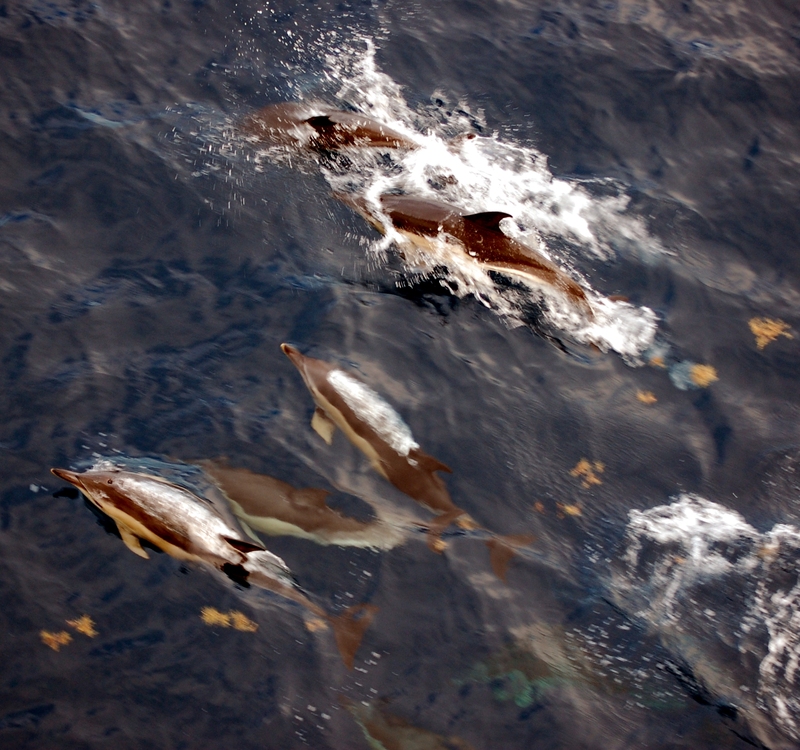 Dozens of common dolphins surrounded the ship on June 19th. Dolphins playing around the ship. Genevieve Davis records dolphin whistles using the ship’s hydrophone as I listen on headphones. From the starboard 01 weatherdecks (the decks on the right side of the boat when facing forward), I was able to hear the dolphins whistling to each other as they played around the ship on June 19th. 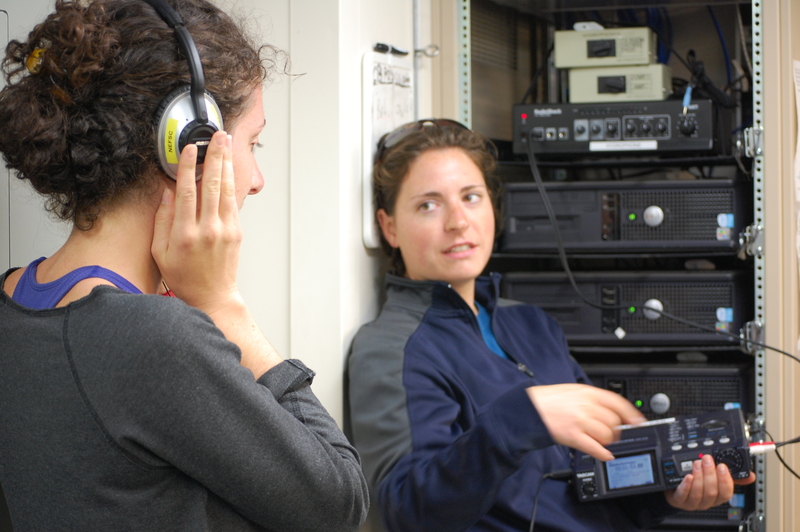 Scientists Denise Risch and Genevieve Davis recorded their acoustics using a hydrophone mounted on the ship’s centerboard. Galley stores are loaded on to Henry B. Bigelow just before departure. Seeing the Bigelow from my cab as we drove onto the pier on June 17th was a bit of a shock for me. I didn’t realize quite how huge it was going to be. As I sauntered up the gangway with my backpack, I thought there was no way I could get seasick on a ship this big. My confidence grew as we left port on the 18th and I felt fine. By the end of the next day (our first full day at sea), though, I was looking for a rock to hide under. A stationary rock. Happily, today felt great. I feel like my normal self again, have gotten into the swing of things aboard, and know my way around the ship. Everyone here has been exceptionally welcoming and nice which made the seasickness easy to forget. Tonight the ship had a summer solstice party on the flybridge. The weather was absolutely beautiful– complete with an orange sunset and glassy seas. 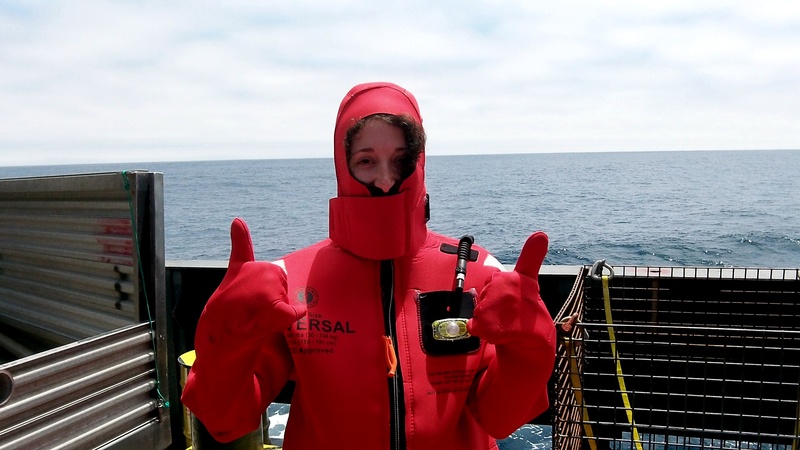 Me in my survival suit during an abandon ship drill. Overall, things are going great here. The ship is comfortable, the food is delicious, and the whale sightings have been absolutely incredible. I could get used to this. The video below is a short tour of my stateroom. Lionfish and more lionfish…..the South Atlantic coastline is getting overtaken by these funny little creatures. Scientists find that they are competing with the Grouper and Tilefish throughout the coastline and unfortunately winning. Speculation has it that at one time dive charters brought this species of fish to the coast for tourist purposes while other speculation tells that people who own aquariums once owned the lionfish kept them so long that they grew so big they had to get rid of them. What better way to get rid of them was to dump them into the South Atlantic Ocean? Nevertheless, they are here and destroying the populations of Grouper and Tilefish. Since 2004 NOAA scientists have been working on this MPA (Marine Protected Area) project to gather data to identify the significant changes in species populations of the lionfish, grouper, and tilefish. Each year they come out to the same plotted MPA’s to check the habitat populations. Unfortunately, the lionfish numbers are increasing and the grouper and tilefish populations are decreasing. So what happens now? Do the grouper and tilefish relocate? Do they become endangered? Do we capture the lionfish and relocate them? There is no real answer to the problem at hand, but this is one example of the many ways NOAA scientists work on protecting marine life. Today I was able to work hands on with launch and recovery of the ROV (Remote Operated Vehicle). Yep, hardhat and all! My job was to make sure the tether line didn’t get tangled and was being fed in and out of the ocean properly. Launch and recovery of the ROV can be a very dangerous operation if everyone is not communicating and alert. I was also able to drive the ROV from inside the ship across the ocean floor about 223ft in depth. Driving was not as easy as it looked. Maneuvering the ROV in the direction to which the scientists need as well as not to tangle the tether. Once the end of the tether is near I had to radio up to the bridge to move the ship in whichever direction the scientists needed to explore next. Finally, as the day was winding down acoustics lab was testing their equipment from the ship. 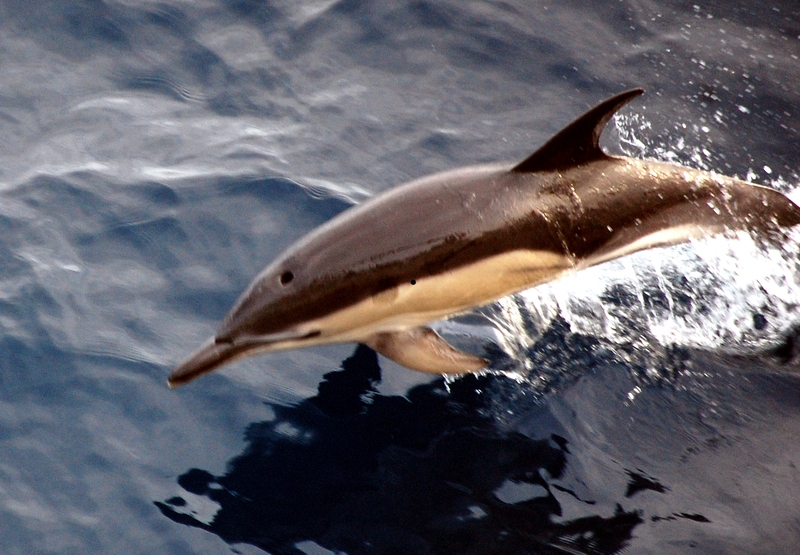 The mammal biologists were able to identify sounds from several playing dolphins! I was able to listen to their playful audio for a while before they dissipated into the ocean. What did I eat for dinner? Fresh sushi, of course! 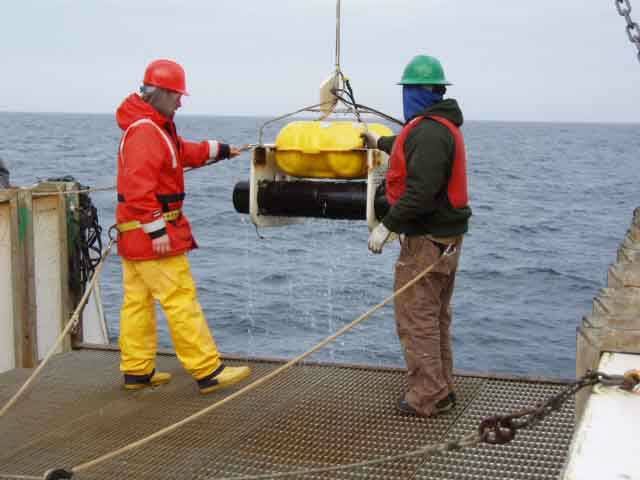 Crewmembers retrieve a marine mammal listening device from the water. 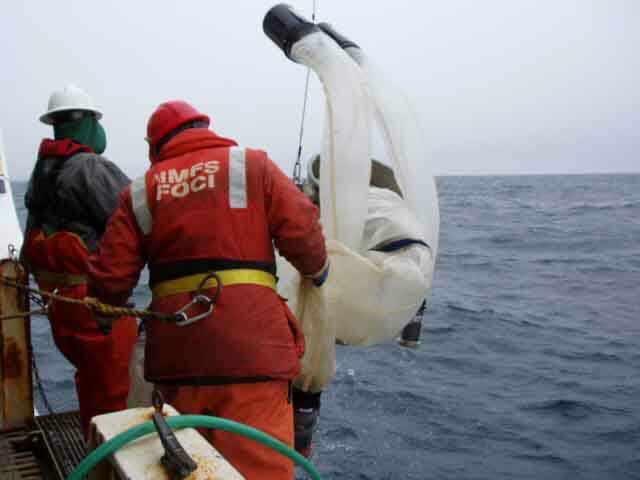 Earlier, a marine mammal listening device scheduled for recovery could not be picked up because the instrument responded to signals and released from its anchor, but it did not rise to the surface for recovery. You may remember the theory was that it was stuck in the mud which prevented it from rising. Well, things changed on the second effort to pick up one of these devices. This one popped to the surface and is now onboard the ship. 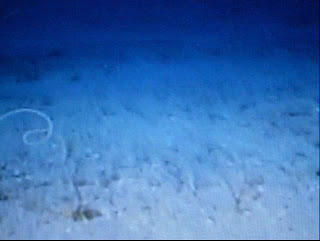 The data and sounds recorded will be of great interest to scientists at the Scripps Institution of Oceanography. A couple of days ago, I sent some photos of brittle stars, bivalves, barnacles and worms that had gathered on a mooring that had been 200 meters deep in the Bering Sea for about a year. Were you as impressed with all the life forms as I was? I expected to see life forms on the marine mammal listening device because it had also been beneath the water for 1 year. You may be surprised to learn that there was almost nothing on the surface of the entire instrument! Would you like to take an educated guess as to the reason for the lack of life on this mooring? You would be correct if you noted that this one was deployed at a deeper depth. In fact, this one was 1,800 meters deep. The role of the sun in starting the process of photosynthesis to feed all life is pretty impressive isn’t it? I hope this example helps you even more appreciate the role of penetration of sunlight into the water as a huge factor in ocean food chains. Four bongo shaped nets were lowered into the water this morning to catch zooplankton. Two of the nets had a 60centimeter diameter and 133micron holes in them. This means that anything smaller than 133 microns simply passes through the net and is not collected. Lots of phytoplankton fall into this category and are not collected. Two more nets had 20-centimeter diameter openings and nets which had 153-micron holes in them. Can you see that these nets are set up to catch smaller plankton species? All nets were lowered to the bottom by a winch until they were 10 meters from the bottom. The nets are then pulled up to the surface by a winch at a rate of 20 meters per minute. All organisms are collected in a cylinder attached to the base of the net. The cylinders are removed from the nets, taken into the laboratory where they are put into bottles. The bottles are then sent to a lab in Poland where technicians use microscopes to identify the species, and the number of each species, in each sample. Today’s specimens had a lot of organisms visible to the naked eye. I will be forwarding a photo in which you may be able to make out some specimens. There were a few fish larva and even some squid larva. Have you noticed that rivers around Virginia tend to have a greenish hue once algae populations begin to grow in the summer? Well, this process also happens in the Bering Sea. The size of the mesh on bongo nets is adjusted during the summer months because a larger amount of algae growing in the water tends to be picked up. These algae may even clog a net if too much is collected. What can be determined by the small specimens collected in the bongo nets? 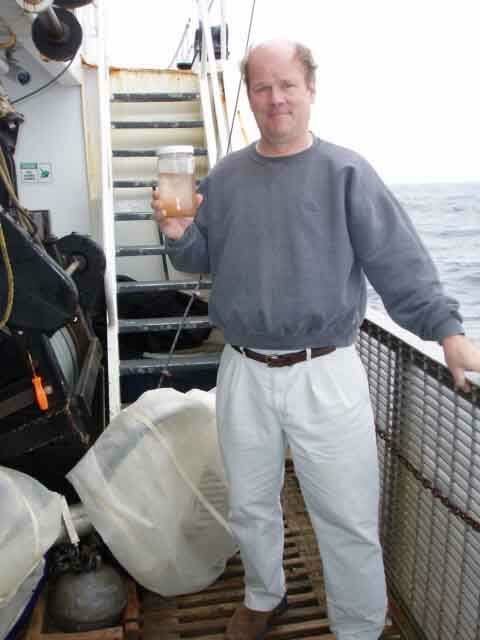 For starters, finding a lot of zooplankton means that larger species are going to have more to eat. This could mean healthier populations and better fishing. Eggs of fish collected in the tows give an indication of the future of fish populations. More eggs may mean more fish. Our friend, the Walleye Pollock’s, eggs soon turn to a larval form before developing into small fish. The larva of the Walleye Pollock have small ear bones called otoliths. These ear bones have growth rings in them which are similar to growth rings in trees. It is possible to determine the age of Pollock larva to the number of days by examining and counting the rings in its ear! Knowing the age and number of larva in the water can be extremely helpful in predicting the number of fish that are likely to be available for harvest in the future. Two instruments have been dropped into the water and they are probably not going to be recovered. In fact there will be no effort to recover them! The first of these long yellow cylinders with satellite transmitters on the top was dropped into the water yesterday. At first, the instrument simply sat horizontally on the surface of the sea until it picked up a signal from a satellite in orbit. When the signal was received by the Argos Drifter, the instrument filled a bladder with water causing it to sit upright and sink into the sea. The instrument descends to depths of up to 2,800 meters. It then rises slowly to the surface, all the time collecting data on salinity. Upon reaching the surface, the instrument transmits all its data to the satellite. After transmission, the instrument dives again and repeats this process of collecting data for 8 or 9 months. 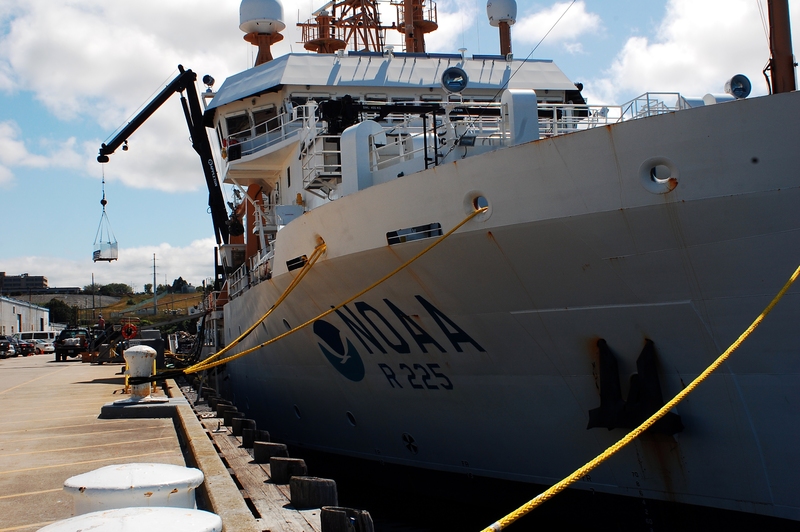 Plans are to have 3,000 or more of these instruments in the water of all the world’s seas collecting data. Do you think that this is an improvement on having to actually travel to a particular site to collect salinity data? E-mails from home tell me of balmy warm weather and spring plants coming out in profusion. Conditions are a little different here today. Hands went back into pockets so that my they would not be made so inflexible by the cold that I could not use a pencil well to keep records when working on the deck this morning. A winter coat and felt liners in my boots felt wonderful. Do you think I may have some adjusting to do when I return to springtime in Virginia? Several of you have asked about stars. It is getting dark rather late here, so I woke up the last couple of nights at 1:00 AM to take a walk on the deck to enjoy the stars. The weather has been pretty cloudy, so I could only see two stars as I walked around the deck. You would have appreciated the flat blackness of the sky, however. I can imagine the stars being quite radiant on a clear night. I will keep looking and let you know what I see. Surimi Crab sandwiches were on the menu for lunch today. Being a big fan of the Chesapeake Blue Crab, I ordered a sandwich and found it delicious. 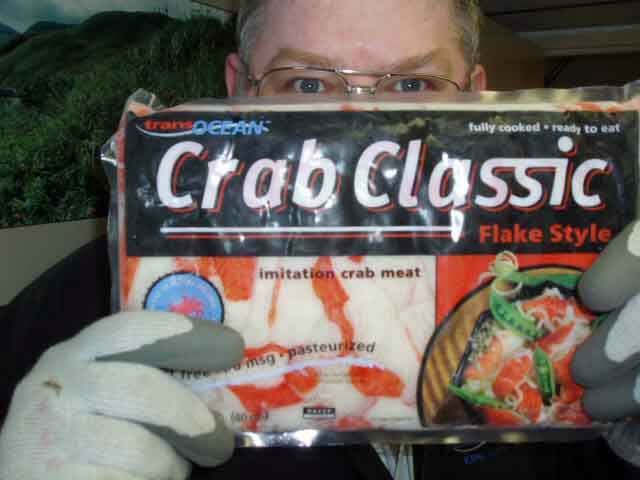 After lunch, I went back to the kitchen to ask Chief Steward, Russell Van Dyke, to tell me about the Surimi crab. I was surprised to find out that there is no such thing as a Surimi Crab! Russell was good enough to go down to the freezer to get a bag of Surimi Crab so that I could look at it. I discovered that the package contained only 20% of a crab product. Now for the question of the day: What makes up the other 80% of Surimi Crab?